For the 24 hours to 23:00 GMT, the GBP declined 0.42% against the USD and closed at 1.3045, amid interruption in further Brexit discussions between UK Prime Minister Theresa May’s government and the opposition Labour Party. Data showed that UK’s ILO unemployment rate remained unchanged at 3.9% in the three months ended February 2019, in line with market anticipation. Meanwhile, Britain’s average earnings including bonus advanced 3.5% on a yearly basis in the December-February 2019 period, rising at its fastest pace in a decade and more than market expectations for a rise of 3.4%. In the November-January 2019 period, the average earnings including bonus had registered a revised similar rise. In the Asian session, at GMT0300, the pair is trading at 1.3055, with the GBP trading 0.08% higher against the USD from yesterday’s close. 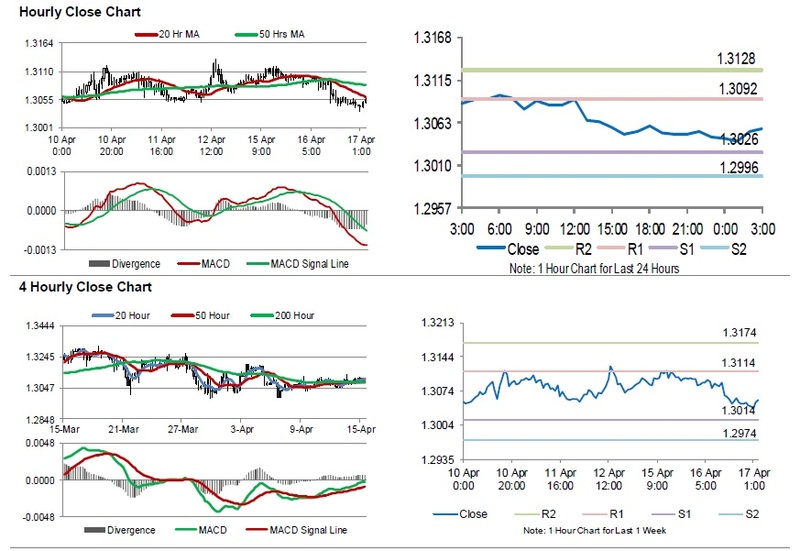 The pair is expected to find support at 1.3026, and a fall through could take it to the next support level of 1.2996. The pair is expected to find its first resistance at 1.3092, and a rise through could take it to the next resistance level of 1.3128. Looking ahead, traders would await UK’s consumer price index, retail price index, producer price index, all for march along with house price index for February, scheduled to release in a few hours. The currency pair is trading below with its 20 Hr and 50 Hr moving averages.